Ben Bernanke began his oft-cited “helicopter speech” in 2002 with a few kind words about his peers, including the excerpt above. Speaking for central bankers, he took a large share of the credit for the low inflation of the 1980s and 1990s. Central bankers had gained a “heightened understanding” of inflation, he said, and he expected the future to bring even more inflation-taming success. Of course, Bernanke’s cohorts took a few knocks in the boom–bust cycle that followed his speech, but their reputations as masters of inflation (and deflation) only grew. Today, the picture he painted seems even more firmly planted in the public mind than it was in 2002, notwithstanding recent data showing inflation creeping higher. Public perceptions aren’t always accurate, though, and public figures aren’t the most reliable arbiters of credit and blame. In this 3-part article, I’m proposing a theory that challenges Bernanke’s narrative, and I’ll back the theory with data in Part 3. I’ll show that it leads to an inflation indicator with an excellent historical record. But first, let’s recap a few points I’ve already discussed. When banks inject money into the circular flow in the process of making loans, they can boost spending above the prior period’s income, thereby fattening the flow (or the opposite in the case of a deleveraging). 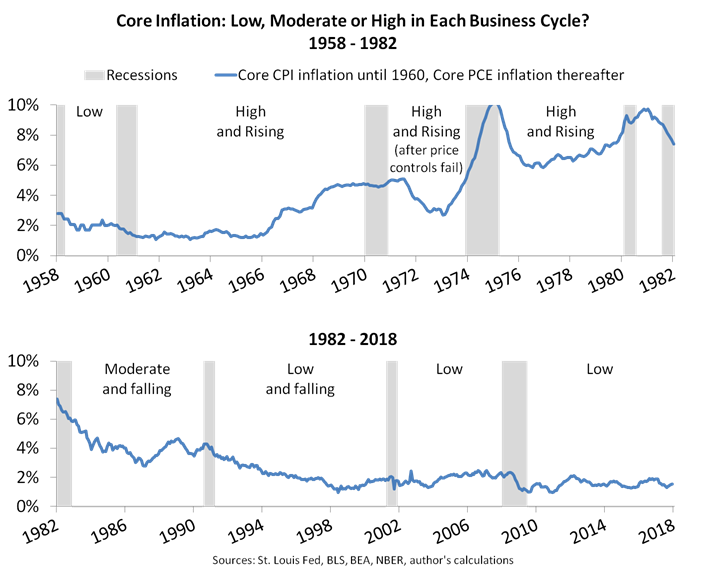 When foreign imports exceed exports, spending might not adequately recycle back to income, opening a leak in the flow (or the opposite in the case of a trade surplus). Those points might sound obvious to some (if not, they might look obvious in the diagrams included in Parts 1 and 2), but they’re inconsistent with mainstream economics. According to models favored by mainstream academics and central bankers, the circular-flow pattern involving bank-created money doesn’t exist. In other words, my way of thinking yields conclusions that you don’t find in mainstream theory or at, say, the Fed. In particular, I’m proposing a circular-flow inflation indicator that consists of bank-created money, the trade balance and real GDP growth. As described in the bullets above, bank-created money and the trade balance measure injections to and leaks from the circular flow—they tell us whether injections and leaks could be upsetting the balance between purchasing power and capacity—while real GDP growth approximates capacity. Using “M63” for bank-created money (see Part 1 for further explanation), the exact inflation indicator is M63 growth plus the trade balance as a percent of GDP minus real GDP growth. The chart shows why it makes sense to evaluate each business cycle as a separate event—namely, business-cycle recessions normally act as reset buttons, crushing inflation by constricting pricing power, which then sets the stage for the next expansion. 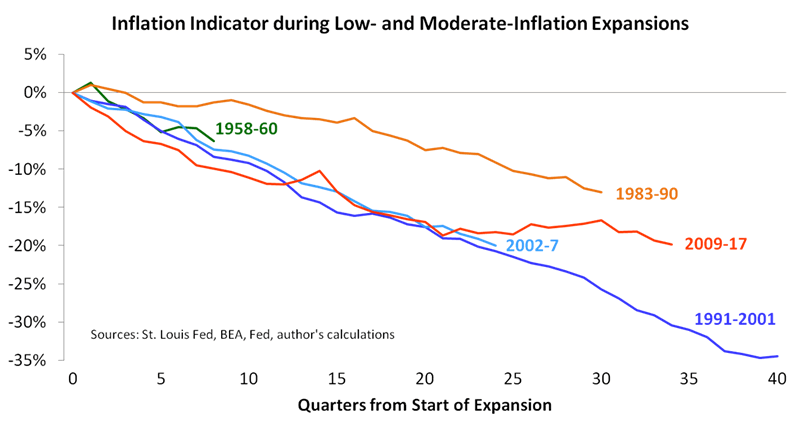 So inflation begins a new life with each expansion, and the chart shows the differences from one to the next. To keep it simple, I assigned each of the business cycles to one of three inflation categories (low, moderate and high), and I also noted whether inflation was rising or falling relative to the previous cycle. As you can see, the indicator went three for three, climbing higher during all three cycles. In circular-flow speak, there was too much purchasing power chasing too few goods. 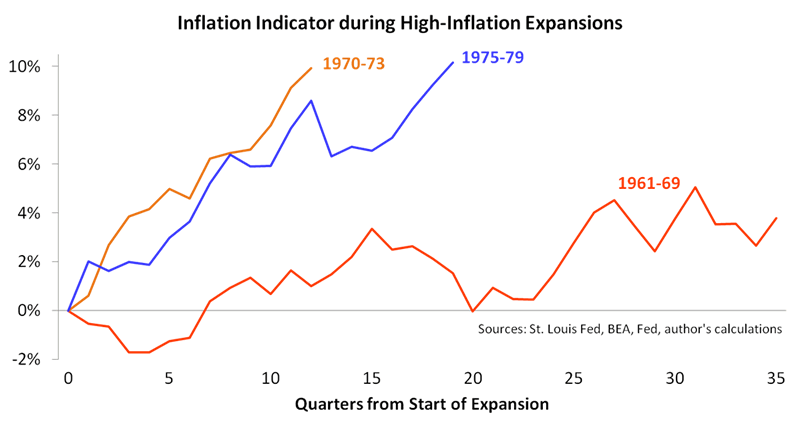 Anyone who had followed the indicator during those periods—basically, the 1960s and 1970s—would have expected the inflation dragon to fly free and been on the money. But what about the five cycles marked by disinflation or low inflation? Once again, the indicator had a perfect record—five for five in predicting the inflation dragon was caged and then being proven correct. In each period of disinflation or low inflation, purchasing power was either losing or at a stalemate in the tug-of-war with capacity, and that continues today, although the trend turned sideways during the last three years. The recent turn from downward to sideways doesn’t tarnish the indicator’s historical performance—which I would call stellar—but if it turns upward from here that would become a cause for concern. Notice also that core inflation jumped above the Fed’s current 2% target at some point during every expansion. In other words, core inflation can be volatile regardless of the circular-flow indicator’s direction. In fact, recent trends in monthly data place core CPI inflation above 2% again by spring or early summer, and core PCE inflation could follow. I mention this because I don’t want readers misinterpreting the charts above, which don’t preclude inflation continuing to fuel financial volatility as during the past month. More to the point, the indicator bears watching as investors wonder if the recent inflation scare will be contained. It isn’t the only way to evaluate inflation risks, but there’s much to recommend it. I would say it fits the data like caroling fits Christmas, it’s as logical as giving thanks on Thanksgiving, and it supplies information not included in traditional indicators—like Groundhog’s Day but without the nonsense. And that’s not all—the circular flow analysis I’ve proposed can also shine a cold light on stories told by mainstream economists. I discussed two of those stories earlier in this article—the Monetarist story and the story of central bank omnipotence—and I have a few concluding comments on each. Monetarism. As discussed in Part 1, Monetarism enjoys nowhere near the popularity it reached in the late 1970s, despite a small tribe of modern-day descendents who continue to fixate on monetary aggregates such as M2. In my opinion, the 1970s Chicago Monetarists were like the 1990s Buffalo Bills—that is, they came oh so close. (Did you think I was going to call them wide right?) They had plenty of research proving the importance of money creation by banks, but they chose to preserve the mainstream narrative that banks are conduits, not creators, of the “initial monetary impulse.” If all of their eggheads hadn’t crammed into the same M2 basket, their popularity might not have fizzled out as it did. In other words, the Fed was probably more lucky than skillful, and it certainly wasn’t omnipotent. Finally, inflation surfs the same waves stocks and bonds surf, but on the opposite phase (with exceptions, of course, such as TIPS), suggesting the circular-flow indicator can also help investors create their own luck. In future commentaries, I’ll make recommendations for applying it to economic and capital market forecasting. In particular, look for research supporting our bond outlook, which should give you another reason to swim away from the mainstream. Who knows? Adjusting your stroke for the circular-flow indicator might make a late but lucrative New Year’s resolution.